Another magnet from my Union Square magnet guy - it's a turn-of-the-century advertising poster created by T.A. 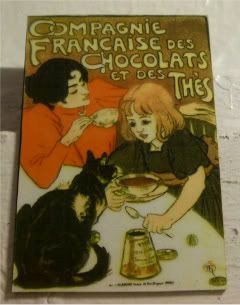 Steinlen for the French Chocolate and Tea Company. It's basically his wife Emilie and daughter Colette, having their coffee and tea (from the French Chocolate and Tea Company), plus their cat, who, by his perch on their kitchen table is meant to show how much of the family. Honestly, I'm just using it for today, because I'm staring at a Pico's leftovers box full of chocolate-y goodness, wondering if I need to get up and walk over there and knock out the rest of the contents. It's the remnants of the Bestest. Dessert. Ever. Called a Diplomatica, it's a flan top half with a brownie bread pudding-y bottom, with pecans on top, drizzled with caramel. Like, had I known that that was waiting for me at the end of the meal, I would have just made it the meal - and then been able to eat the whole damn thing. Or at least until next year's OTC, anyway!